People are always asking me about how to recover from ME/Chronic Fatigue. I would simply say: practice yoga; especially correct breathing and meditation, try to live in the present moment, eat healthy whole foods, only make constructive relationships with people who are positive and who give you pleasure and don’t fritter away your energy or prana on overloading the senses with shopping, computing, radio, TV or stuff that is depleting you. Accept what is for now. And most of all, try to find your spiritual core. I sincerely hope yoga leads you to this. I suffered from the most severe form of fatigue – M.E. – before yoga helped my recovery. In 1989 I was running a successful public relations company. My job was very stressful and I worked very long hours. I didn’t take lunch breaks or holidays and I often worked at weekends. In order to prop up my flagging energy levels I ate lots of junk food, including sweets and chocolate. When I went home I would drink a bottle of wine to numb the exhaustion and slow down my racing brain and I would heat up a ready-prepared meal in the microwave. The first warning I got that all was not well were panic attacks. For no apparent reason I would start to feel shaky, anxious and very strange, as if I wasn’t really there. I would have difficulty getting my breath. This was followed by chronic insomnia; sometimes I went for two or three nights without sleeping at all. I thought the answer was to ignore the distress signals my body was sending me and work harder. I also joined an aerobics class, which I squeezed in to my lunch hour. The fatigue was incredible – I was always tired – but I just ignored the exhaustion and got on with running my business. In fact, I didn’t really thing about the fatigue – I just assumed that it was normal, that life was like that and it was something I just had to accept. Then I got what I thought was flu. After three days in bed I dragged myself back to work. I was totally wiped out and dizzy, but I thought I had to work or my world would cave in – especially as I owed the bank £50,000 and had a huge mortgage of at least treble that amount. My doctor took some blood tests and later told me I had glandular fever caused by the Epstein-Barr virus. She advised me to rest, so I slowed down a bit – but not enough. Three months later I sold my business. I then started working as a television researcher but then developed some unnerving symptoms that I couldn’t ignore. The exhaustion would get so bad that sometimes I couldn’t even speak, and I would have to go and lie down. One day my husband found me on the floor – I couldn’t move! If I rested I was still tired. I managed to struggle on with my job, even though it meant lying down during the lunch hour rather than socialising with others in the production team. This way, I managed to keep my condition secret from my work colleagues. To admit to being tired or ill was something that wasn’t allowed in our hard-driven consumer society. I existed on chocolate for a quick boost of energy but that soon wore off. My health deteriorated until in 1992 I was in a wheelchair. At this point I was too tired even to hold a conversation. I was also facing some prejudice, in those days some of my friends and family, encouraged by bad press and ignorant doctors were very scathing and didn’t believe that I had a real physical illness. However, simple things like making a cup of tea were like climbing a mountain and if I over-exerted myself it would take days to recover. I was taken into hospital for three months and put on various drugs, which, in hindsight, made me much worse. I was also given Cognitive Behaviour Therapy. This didn’t improve my energy but it did make me much more positive about life and my outlook. I also met a wonderful woman in hospital called Nancy Farley who introduced me to meditation. 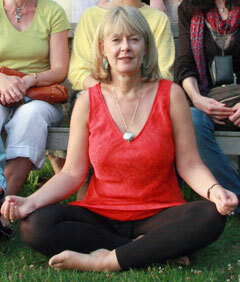 In 1993 my local yoga teacher, Angela Stevens, asked me if I would help her to set up a yoga group for people with CFS. She had noticed that this was a common problem and thought that remedial yoga would help. I wasn’t so sure – strenuous exercise was the last thing that I needed – but Angela assured me that yoga would be beneficial. So I got together a group of people and we started. Almost immediately I began to feel better. Angela concentrated on yoga breathing, relaxation and meditation. There were some gentle stretching exercises to get our systems going and to build up our muscle groups but we took these very slowly and at our own pace. Sometimes I over-estimated my health and did too much but that was usually because I was trying to keep up with someone on a higher level of ability. The first rule of yoga is to listen to the body and work with it, not against it! I started visiting the Yoga for Health Foundation, which was, in 1993, the largest residential yoga centre in Europe. They were doing a lot of work with M.E. as well as with other chronic conditions – and I learned more about the importance of proper diet and meditation During my time there studying and practising yoga, the improvement in my health became so dramatic that I realised that yoga was having a profound effect on my well -being. Pranayama – or yoga breathing – was really important in my journey back to health, as were the relaxation and stretching postures. Gradually I became physically stronger. I also became much more spiritually aware as the more I practised yoga; the more I was getting in touch with the ‘real’ Fiona. One of my teachers, Bill Feeney, says that the ego is like a large parrot on the shoulder and we should aim to reduce this to a small sparrow, in order that the ego and attachment to the material world are not driving us and that we can listen in to the true self. As I started to study the sutras of Patanjali in order to learn more about the philosophy of yoga. I tried to incorporate the yamas and niyamas (moral codes of conduct and restraints) in to my every day life. In studying the sutras I was also interested to learn how yoga is about quietening the mind. Since, like many people with M.E. I always had a hyperactive mind that used to drive me crazy and which was, no doubt, stimulating the whole of my nervous system, this touched a chord with me. Living in the present moment is a very important lesson and so the process of calming the mind, connecting with the real self within and working towards liberation, which Patanjali talks about, is, I think, vital for recovery from chronic fatigue. A mind, which is always active, is so exhausting. Staying in the here and now reduces so much tension and worry and allows us to be happy. Also, being present helps us to be much calmer about the future. For example, if I had a relapse, I would always panic about how that would affect me, what I would have to cancel and not be able to do. This worry would then lead to further illness and exhaustion. By learning to surrender – a key lesson in yoga – I was able to just accept that this is how I was for the time being and let go of any anxieties about the future. I could choose to be ill and unhappy, or ill for now, and happy. This state of mind got me out of relapse faster than any pill I could have popped. By 1999 I was beginning to teach yoga to other people with M.E. and I started a teacher training course with the Yoga for Health Foundation, which I completed in 2002, In 2003 I was contacted by Alex Howard who wanted to interview me for a CD he was making to go with his book ‘Why ME?’ I read Alex’s book and it really resonated with me. Alex is over 20 years younger than me and yet he was giving me a lesson, which I had understood intellectually but not actually put in to action. This was that, if you want to get better, then you have to live an authentic and happy life. In other words, you have to be true to yourself and be your real self. At around the same time I read Ekhart Tolle’s book ‘The Power of Now’ , a book I continue to refer to and which inspires me. In 2004 I left my marriage after 24 years. My yoga journey and the lessons I learnt woke me up. I had been locked for years in an unhappy, destructive relationship, which left me permanently on edge and stressed. I realised I would never truly recover until I was in a situation where I could be true to the real Fiona. I went to work at the Yoga for Health Foundation – doing a bit of teaching but mainly working in the kitchen, which I loved. Meditation becomes so easy when doing uncomplicated tasks. In 2005 I went to do some more teaching in India and then returned to London, where I taught yoga full-time in various yoga centres for two years, before going off to travel to India in 2007 to study again. I now teach in the UK and abroad taking yoga retreats and workshops for all kinds of people – for those who are healthy and for those who have chronic health challenges. I am a huge admirer of the teacher TKV Desikachar and completed training in this tradition (Krishnamacharya) in 2011, which is accredited as an advance course with the British Wheel of Yoga. I am particularly interested in yoga philosophy and how we can take this in to our every day lives. I am now based near Portsmouth in Hampshire where I am blessed to have the energy to teach, write and travel. My own enquiry draws me to look at Freedom, or self-realisation as I continue to look at my own patterns and examine what is really real and true. All this has contributed to my recovery. I have learnt a lot more about prana since I wrote the first edition of the book. I know that, for example, when Patanjali recommended that we control our senses that, had he lived in the 21 st century, he would probably advise that too much materialism, or overloading of the senses by continual TV, noise or stimulation, wears us down and takes us away from our spiritual core. I now know that my illness was sent to wake me up to my spiritual truth, and in that sense my M.E. although very traumatic, was a blessing.